This Space Blanket is based on technology pioneered by NASA that uses science instead of electricity to prevent hypothermia. It is lightweight, durable, versatile. 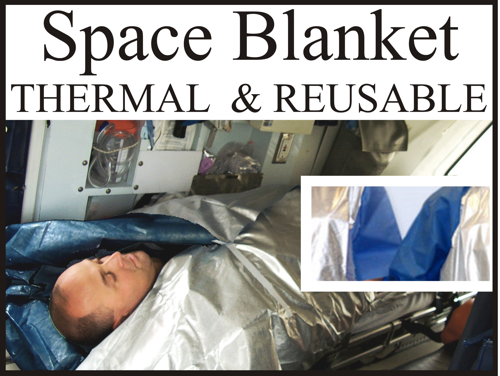 The Space Blanket works by preserving or banking a patient's core body temperature. The innovative Space Blanket's material reflects a patient's endogenous radiant (infrared) heat, banking it in the body's core, while preventing convective heat loss (wind chill). The special silver material is lined with a soft, blue, patient-friendly inner surface. This Space Blanket is so trusted, it has become a part of the U.S. Military's Hypothermia Prevention Protocol. The Space Blanket has proven effective in a variety of applications, including healthcare, EMS and survival gear. Meets "CFR Part 1610, Standard for Flammability of Clothing Textiles"
For trauma patients, or for any patient that has, or may have, the potential for a decrease in core temperature, it is a must...We use it for trauma, long outside exposure, blood loss...We have had excellent results...We would recommend it very highly for anyone..."
When used on top of the body while on the Bio-Mat, the Space Blanket increases the intensity of the infrared, keeping you nice and toasty warm. They are very light weight, warms the body very fast. In fact, they warm the body faster than a fleece blanket. Keep one in your vehicle for emergencies. please call 360.944.8692, Healing Waves, LLC. We love our Space Blankets, and we are sure you will be pleased with yours also.